Before and during Jerry Brown’s September 12th – 14th Global Climate Action Summit—where he is promoting himself as a climate leader and advancing corporate-friendly solutions—grassroots communities and movements will stage a series of events demanding real climate solutions that build economic and environmental justice and center the leadership of people most affected by the fossil fuel industry. Climate Non-violent Direct Action Training, led by Diablo Rising Tide, 1 -5 PM, Greenpeace Warehouse, 955 7th St., Oakland. RISE for Climate, Jobs and Justice, the biggest mobilization on the West Coast, one of thousands of rallies around the world in advance of the Global Climate Action Summit, demanding real climate leadership, no new fossil fuel projects, and a just transition to a 100% clean-energy economy for workers and communities. 10 AM, Embarcadero Plaza, San Francisco. Then march to Civic Center Plaza for a resource fair showcasing local climate activism– your chance to plug into ongoing work for real solutions. 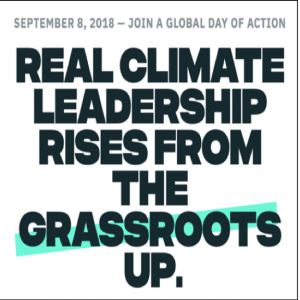 It Takes Roots Member Assembly, for members of environmental and economic justice organizations that are part of four national coalitions: Climate Justice Alliance, Grassroots Global Justice, Indigenous Environmental Network, and Right to the City. Meeting to share information and plan ways to combine local solutions for national impact. Climate Finance Summit: A free, all-day event sponsored by Fossil Free California and partners, exploring the topic of fossil fuel finance, and what we can do as individuals, climate activists, and municipal decision makers to accelerate the transition to a low-carbon economy.